If you have unmanageable hair that you want to straighten, keratin treatments are a very popular semi-permanent solution. Though usually carried out in salons, these days, you can find affordable keratin treatment products for home use as well. Since some keratin treatments can involve dangerous chemicals like formaldehyde, we thought it best to create a shortlist for you. Our selection of the best at home keratin treatment options is based on customer ratings and reviews. Check the reviews below to find out which is the best option for you. 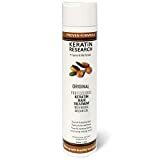 Keratin Express Daily Keratin Hair Treatment Heat Protector for All Hair Types, 6 fl oz. 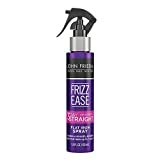 Control frizz, repel humidity! Lock-in color and speeds up drying time. The only way to enjoy sleek, smooth hair between shampoos! Compatible with all keratin treatments! Contains no formaldehyde! As the name suggests, this is a hair treatment serum designed for daily use on frizz-prone hair. It is a great choice if you frequently use flat irons or other types of styling tools. You can use this keratin treatment after washing your hair, to prep your hair for styling. The great thing about it is the fact that it helps maintain the anti-frizz nature of your hair day in and day out. It is available in a small bottle, but that is more than enough for a couple of months, as you only need a minute amount to cover your hair. This thick cream contains the goodness of natural hydrolized keratin. It contains no formaldehyde, and can be safely used on colored hair. This is a semi-liquid balm available in an 8 ounce/240 ml tube. It is a very strong, heat-activated treatment balm, designed specifically for normal hair. Apply this balm on your hair before using your flat iron or hair curler for best results. It contains a unique formula boosted with acai. The balm works by creating a protective layer over individual strands of hair. When heat is applied, it locks in the vital moisture, hydrating your hair, and preserving its strength. At the same time, it locks out harmful humidity from your hair, reducing the chances of frizziness and unwanted curls. If you want to get salon-grade hair at home, TRESemme has a very potent keratin treatment for you. This is a 7-day treatment that creates a barrier between heat and your hair strands. It can change unruly and frizzy hair into smooth and manageable locks, thanks to the keratin infusions inside the formula. The transformation wrought by this keratin treatment can last for up to a week. All you have to do is apply the product on wet hair, blow dry, and then use a flat iron. The treated hair will be able to withstand temperature and humidity changes with ease, due to the locking technology used in this treatment. This treatment is available in the form of a handy and easy-to-use spray. It contains a proprietary blend of potent polymers infused with the goodness of keratin. When you apply this spray to your hair, each strand gets wrapped with keratin. The sealed hair can stay straight for three days maximum. That is fantastic value for money, especially for a home treatment solution. If you have curly and frizzy hair, this spray can have a radical transformative impact on it. As with other similar products, you need to heat your hair for the spray to do its magic. MULTIPLE BENEFITS FOR BEAUTIFUL HAIRS - This single formula acts as an anti frizz hair product, a hair straightener and a repairing deep conditioner all at once. Its unique blend of ingredients promotes healthier, stronger hair while making the tresses easier to manage. EXCLUSIVE KERATIN TREATMENT COMPLEX - Our keratin treatment complex combines all-natural keratin proteins with hydrating argan oil and a combination of strengthening collagen, silk amino acids and soy and wheat proteins to offer unparalleled benefits for the tresses. NONTOXIC, GENTLE HAIR STRAIGHTENER FORMULA - With its SLS and formaldehyde free keratin complex, our formula addresses multiple hair care concerns without harsh, toxic ingredients. SIMPLE TO USE, ENOUGH FOR 8 APPLICATIONS - One treatment with our exclusive keratin formula can be completed in just 90 minutes with long-lasting results. Each bottle contains enough product for 8 applications on average. SPECIAL OFFER LIMITED TIME!! - Da Milla is 100% committed to customer satisfaction. We offer a No Risk, Money Back Guarantee on our home keratin treatment, so that you can experience its benefits with confidence. This is an at-home keratin treatment hair mask infused with all the nutrients and proteins your hair needs. The complex formula is designed to heal damaged hair and prevent future damage from heat treatment or chemicals. This is the ideal product for hair that has been severely damaged by coloring, harsh styling products, or just plain old heat from straightening sessions. Along with hydrolyzed keratin, this mask contains natural ingredients like argan oil, jojoba oil, aloe, coconut oil, and more. It hydrates and strengthens your hair strands, removing unwanted dryness and frizz in the process. This results in hair that is silkier, straighter, and glossier than ever before. L'ANZA Keratin Healing Oil Hair Treatment, 3.4 oz. If you want a keratin hair treatment that fortifies the hair strands and protects them against heat damage from the inside, L’anza is worth a look. It can heal your hair, delivering glossy and healthy hair in a short period of time. All you need to do is apply this product regularly on your hair before blow-drying or styling. It contains a strong fusion of Phytol IV and keratin complex. This formula hydrates your hair like never before, giving it strength from the inside. Expect more volume, shine, and gloss from your hair when you use this product. This is the best at home keratin treatment to restore excessively brittle, damaged, and dry hair. It is supposed to be applied on your hair after a shower. The product is unique due to its healthy pH balance. It penetrates into individual hair strands within minutes, and starts revitalizing and repairing hair that has been damaged by chemical or heat treatments. This ApHogee hair treatment contains a potent mix of natural ingredients like keratin, fruit and vegetable extracts, amino acids, collagen, and other healthy compounds. It prevents breakage and split ends, and makes your hair soft, glossy, and shiny. This is a very effective, professional-grade keratin treatment that can smoothen and straighten your hair for several months. It has a unique express formula, fortified by Inverto keratin. This exclusive formula speeds up the straightening process, delivering results within minutes and hours, not days. You no longer have to wait for several days before washing your hair after a keratin treatment. This advanced formula is also very nourishing, as it contains natural components like argan oil, coconut oil, jojoba, sunflower seed oil, and other natural minerals and proteins. SMOOTHER SOFTER LOOKING HAIR: We know what you love about your hair, so we made blended with exotic, ingredients to help you love it even more. Our spray can help leave your hair smoother, softer looking locks after you wash. THIS OGX FORMULA is packed with so much good-for-your-hair goodness so it helps smooth your hair cuticle for radiant, brilliant tresses, helping to drench each strand in moisture helping your hair feel soft & look smooth, with a luxurious glow. This is another popular home-based Brazilian blowout treatment. It contains no harmful sulfates or sodium compounds. Your hair will get an amazing glow and shine, and the product will provide a frizz-free, straightening effect. This keratin-based spray uses natural ingredients sourced from Amazon jungles. It contains ingredients like aloe, cocoa, and avocado extracts. This spray has to be applied on dry hair. You can then use a flat iron for the smoothening and straightening action. Like other products in this category, the OGX spray is also ideal for beginners. This It’s a 10 product really does get ten out of ten in our books! This is the best at home keratin treatment you can buy. The serum helps strengthen your hair, protecting the natural keratin structures inside. You can use this spritz serum is multiple ways. It can be used just after a shower as a styling aid, or as a protective shield before heat treatments. The product is a light, fragrant conditioner that can protect against heat damage. It nourishes and revitalizes the hair strands from the inside, using keratin. With daily use of this serum, you can get glowing, frizz-free hair. All the best at home keratin treatment serums and sprays use natural keratin to create a protective layer around individual hair strands. If you want to protect your hair against lasting damage from heat, you need to pick a safe and effective keratin treatment. Did you like our list? If you have any other best at home keratin treatment suggestion, kindly let us know in the comments section.